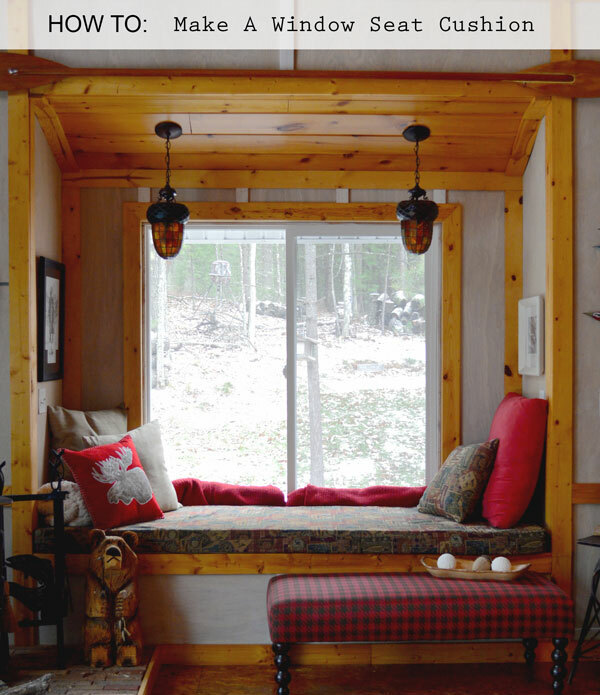 When we built our cabin, we decided right away to incorporate a large window box with a bench. This is a perfect place to lounge and read or to watch the birds and other wildlife. Because the seat needed to be comfortable, I knew that I would need to get a cushion for it. This meant I was either going to have to have a window seat cushion custom made for it, which would be WAY too expensive based on the size, or make one myself. I opted for the latter. However, I wasn’t exactly sure how to make a window seat cushion. I had never done such a thing before but I wasn’t going to let a little thing like that stop me. I’ve made plenty of pillows so this would basically be just a larger version. Of course, I wanted it to look like an actual cushion and not just a giant pillow. I ended up finding a pattern for making a box cushion with a zipper and modified it to fit my dimensions. The most important thing that I needed was a good quality foam. The seat was going to have to be comfortable! I measured the area. It was like two feet by eight feet. Big enough to sleep on! I was almost intimidated but not quite. Fortunately, I found a great place online for purchasing cut to order foam. You simply select the size (shape), thickness, and denseness of the foam you would like. For a window seat, I would recommend going with their XL-38-firm foam with at least a 4 inch thickness. This will give you the comfort and durability that you need. The next thing of course is the fabric. It’s important to use a thick home interior fabric for the best durability. Instead of going with a plain fabric, you might want to pick out a fabric that will highlight what is special about your retreat. Our cabin is on a fishing lake so I chose a fabric with fish, rods and reels which blends in well with the rustic decor. Of course you also need to look at the other fabrics that you have in the room. If you already have a lot of busy patterns, then pick a plain fabric that coordinates with the other colors in the room. You can always throw in some accent pillows to highlight your interests. These instructions are for a box pattern with a zipper. Depending on the length of your cushion, you can decide how long you want the zipper section to be in the back. Purchase a good upholstery zipper from a fabric store. The sizes available will help you determine how long your zipper section will be. Remember that you will want the opening large enough to be able to stuff the cushion in easily when the project is completed. First cut two pieces of fabric – one for the cushion top and one for the bottom, allowing for at least a 1/2″ seam allowance on all sides. Next cut the two short sides, thickness of foam + seam allowance x length of side. Now cut the front side. If you purchased a piece of foam with a 4 inch thickness, then you would cut your material, 5″ xlength needed plus seam allowance.If your cushion is real long, like mine was, then you will probably have to cut a couple of pieces and seam them together. Center the seamed area in the middle of the cushion for a more uniform look. Your final cuts will be for the back and zipper section. You will need two pieces for the zipper section. Using the example of the 4″ inch foam, you would cut each piece 4″ by length of zipper plus seam allowances. The remaining two pieces make up the difference in length in the back of the cushion, one piece at each end of zipper section. Cut these with an inch and a half seam allowance. Now start piecing everything together. Sew the zipper section first and then attach it to your two short back pieces with a half inch seam allowance. Since there may be a small gap between seam and where zipper starts, fold material down to cover gap and topstitch in place. The zipper start will hide under the fold. Sew the rest of the side pieces together. Attach the top piece to the boxed side. Attach the bottom piece keeping the zipper open. If you measured correctly, your cushion should fit just perfectly in your window seat. Now that you know how to make a window seat cushion, maybe you want to make an assortment of window seat cushion covers for different seasons or holidays!